Roll In Shower Unit features an integral ramped entry, Base Only or with Shower Wall Surround Panels. 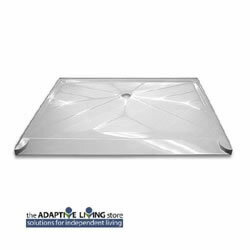 Roll In Shower Bases with ramped curbed base are available individually or with Shower Wall Surround Panels. Optional Accessories: 2" Drain, Corner Trim, Rubber WaterStopper, Weighted Shower Curtain. Over 50 Premium and Standard Granite Colors available.